Just in time for you to relax and enjoy some post-holiday needlework, I’m giving away one of Trish Burr’s new Projects CDs! It’s almost like getting seven embroidery kits in one simple format! 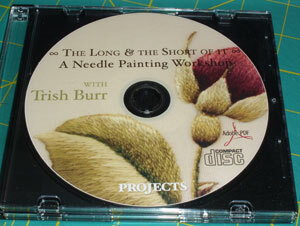 Trish has recently produced a Needle Painting Workshop CD and DVD called “The Long and Short of It.” What I’m giving away here is just the project CD, courtesy of Trish. It comes in a hard jewel case, for safe storage. The CD contains three sections: a PDF on stitching instructions (understood best, I think, in conjunction with her DVD), a PDF of clear, printable photos of each of the seven projects on the CD, and a PDF containing all the information for the individual projects. 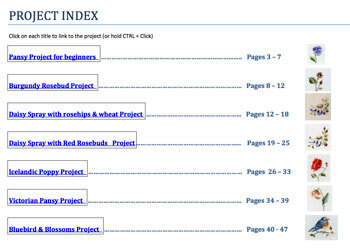 On the latter PDF, you’ll find it starts with a clear, clickable index for each project. 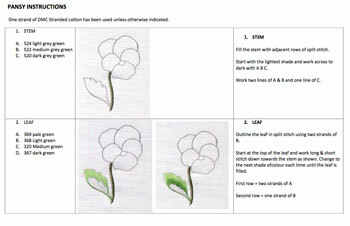 … stage-by-stage photo instructions for the project. I tested the CD on both my PC and my Mac, and it works great on both. This CD really is a lot like having SEVEN of Trish’s kits at your fingertips for whenever you want them! (Minus the actual fabric and threads!) If you have a stash of DMC floss and some decent muslin or linen on hand, you’d be good to go! UPDATE: Tuesday, December 22nd: If you live in the US and want to order Trish’s DVD / CD set, the best way to go about it (to save you on shipping and handling and time) is to order through Nordic Needle. Right now, the set is not listed on their website, so you actually have to call and place the order. You can find a toll-free number on their contact info page, on the bottom of the website. They have a limited number in stock right now. If you do call them, tell them you’d be interested in seeing Trish’s kits in their online store, too. RIght now, they aren’t carrying them, but I hope that they will in the future! Are you planning to make any New Year’s Resolutions that involve stitching? If so, what’s one of them? 3. Leave your comment by Saturday, December 26th, at 5:00 am CST – I’ll announce the winner on Saturday! The winner will need to contact me with a mailing address within 48 hours; otherwise, I will need to re-draw for another winner! Hey….I'd love to have this DVD. I don't really believe in New Year's resolutions but if I did, I guess I always have a standing resolution every year to get to more of my stitching projects and especially to finish more of my WIPs. My stitching resolution is to try 3 new techniques: silk painting, Schwalm, and goldwork. I've also volunteed to make and repair vestments for our parish and to pursue any new techniques needed for that venture. I will still have time to do other projects, so I hope I win this give away. My new year’s resolution is to try new embroidery projects involving new stitches other than cross-stitching,to expand my creativity and this give away would be great. My answer to the question of what I want to do in the way of doing any or all embroidering projects for 2010 is to learn everything I can about the wonderful art of embroidering. I subscribed to your website about a year ago and each day I look forward to logging on to my computer just to see what you, or one of the persons that you feature sometimes, has done. I wasn't able to do anything at that time, because of an accident that I was involved in, but now that I'm mended I'm ready to learn all the techniques and stitches and everything that involves this art. I;m renewing the New Years needlework resolutions that I've made for several years. 1. Strive for quality not quantity. 2. If I really don't like the piece, give it away. If I can't give it away, throw it away. UFO's stifle creativity. 3. Don't get too comfortable. Try something new. When it comes to needlework, I've only done it on one BIG costume project that's got a deadline at the end of January, and is for a competition. I've learned a lot because of this project, but the deadline and the sheer amount of stuff to get done has taken a bit of the fun and creativity out of it. My New Year's resolution in regards to needleworking, then, is to work on a project that doesn't have a deadline, that I can be creative with, and that is simply just for my own enjoyment! 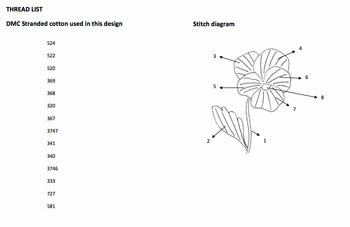 In addition, I've always been interested in design, so I want to design and make some of my own needlework patterns and distribute them as freeware for others to enjoy. For 2010 I plan to organize, organize, organize! Stitching time is precious as we all know. It's so precious that I don't want to waste any time looking for something that I KNOW is around here somewhere! This CD would give me a wonderful opportunity to perfect my long and short stitch. It has always been a technique which I have admired but which I have failed to truly master. Thanks so much for this opportunity. My resolution will be to only do one project at a time, finish what I start. I've done this before but this last year didn't stick to it and oh, what a mess! My goal for 2010 is to finish my English Bird Sampler. I have all of it completed except for the two open work square sections. I have attempted but do not know how to do these stitches. I plan to spend time learning how they are done so I can complete, display and enjoy this sampler. Working on this sampler brings back wonderful memories of a stitching group I attended where I started it. Those ladies were wonderful to visit with and I would love to share a photo of this finished project with them. I have been getting your newsletter for quite a while and love the way you share instructions of so many techniques. You are inspiring me to get back to stitching that I love. Hi, Mary! I certainly do have New Year's stitching resolutions! I want to keep my projects ready to go to follow your 15-minute practice, finish my Long and Short Stitch lessons (shame on me! ), and finish the Nativity scene I've started for this Christmas – but which is too big for me to do it, so I want it ready for the next one! Thanks for the give away! 🙂 And happy holidays! Beautiful work and yes, I would love to have the DVD! Like one of the comments above, full bore a head to finish really old projects then something new comes a long and burn out time! I hand embroider on a CQ quilt, hand quilting a snowman quilt and tat just a little every day. This is a wonderful looking CD. I bought the beginners kit from Threads in Bloom to learn Brazilian embroidery. Hope to spend some quality time with needle and thread This CD looks beautiful and I have run across Trish's work….gorgeous! My New Year's resolution is "complete, complete, complete" or "focus". I'm really focusing on the Bead Journal Project and finishing some things I've had in process for years now. I'm also setting aside more time for stitching so I can really accomplish these goals! Organize, organize, organize! This stash of mine is getting out of control, and I'd like to whip it into shape. your giveaways are always tempting me like anything. I am already dreamimg the plans if I won the kit. When it comes to resolution usually I dont make any. Stiching has become my part of life so something or the other I always stitch. Since there is my daughter's birthday in the first week of february I have to complete one dress for her by the end of January and can I say it as a must resolution!! I plan to organize my workspace to find more time to stitch at home. And I will give away some ufo's to our guild's sale. As well, I hope to have more stitching days with friends as we all work on our needlework. Then you have the fun of stitching in a social atmosphere. I have made two other resolutions for this new year. Happily, I have completed both with the support of friends. My last hurdle is my sewing resolution. I want to make both of my daughters hand embroidered quilts they can keep in their hope chest until they are grown and start a home of their own. This project means a lot to me because I won't be there to see this become a reality. I have a terminal illness and don't know how long I have left. I have never embroidered before I found your website (except cross stitch), but you made it look so easy! And the video tutorials on your site are out of this world!! I am currently trying to do a "flower of the month" to quilt for one of them and havn't found a project yet for the other. This video would really be a blessing. It would also be a blessing I hope to pass on to my girls so that they will feel I am a part of their lives for a very long time after I am gone. Hi Mary, wat a lovely gift ; Ï would be very delighted to receive it. For 2010 I intend to improve my embroidery skills, especially Stumpwork and needlepainting . For me a real challenge , because I find these techniques quite difficult. merry Christmas from Switzerland . Like many stitchers, I want to stitch everything. Learn and perfect every technique and most of all finish all of the projects I've started. But my resolution this year is to continue to enjoy stitching, and hopefully manage to get some of my wants accomplished. And, for once in my life WIN something! The CD would be a great start. My main goal is to "take back" my sewing room, which has become a sort of catch-all/office, and set aside at least one evening a week to stitch. I loved the long-and-short lessons. All I did before is crioss-stitich and some pulled work, and am really enjoying starting on threadpainting. This CED set looks great! My New Years resolution – I must finish at least one of my unfinished projects a month. I find I start a project with enthusiasm but if it becomes difficult or it lasts too long it gets relegated to a draw and (almost) forgotten. I feel quite guilty about this hence the New Years Resolution. I did purchase Trish Burr's kingfisher and, yes, I did finish it and it turned out so beautifull my husband says he is going to get it framed. For the New Year, my goal is to finish 10 UFOs. This includes both stitching and already made quilt tops. Also, during my holiday vacation, I hope to finish organizing all of my CQ supplies. My New Year's resolution is to embroider more instead of quilting. I am burned out and need the sedentary break that embroidery provides. I also think I had stopped embroidery because I was burned out on trying to do both quilting and embroidery. One at a time is much better; I have new threads that I have not tried. Onward I go during next year. Arrgh! I would love to own this CD as my long/short direction is not good. I visit often, Trish Burr's site to see her wonderful stitching. Winning this give-away would be a thrill! I am a full-time graduate student, and mother of two and I find nothing "de-stresses" like picking up my needlework for a bit in the late evening. During 2010, I'm planning on perfecting my new needlepainting skills and I am also planning on diving in to crewel work. Following your needlepainting course online really helped me to improve my surface embroidery and I love the results. Trish's Project CD would be just the thing to take me to the next step! Thanks for thinking of us Mary, you're blog is always a bright spot to our day! Hi Mary! My plan for the new year is to learn 10 new stitches and to master them. I have been just playing around with embroidery and I have become addicted. My poor cross stitching will be taking a back seat for a while. Thanks for the opportunity…. Hmmm, my stitching resolution for next year? I've been thinking about starting a new CQ project but not sure quite what it will be yet. I have a bunch of old hankies that I inherited from my grandmother and I think they might become part of it. I hope you and yours have a very happy Christmas! First of all, I wish you and your family a Merry Christmas. Yes, I would love to have this Trish Burr CD. Maybe it would help me figure out what I did wrong on my second pansy. My resolutions are to finish my Pansy Quilt Wall Hanging. I always seem to give my creations away, but this one is for over my bed. Also want to keep up with Sharon B's TAST, and work on new kinds of embroidery for me – blackwork, goldwork, whitework, etc. Thank you for all you do. Yes! Do MORE, BETTER ! Thanks for your blog and all the other work. I downloaded several of your patterns this other day (having just found you) and man-oh-man, they are gorgeous! Yes! I have a lot of plans that involve stitching in the New Year. I am starting a group at my local quilt shop called A&E; (applique and embroidery). We have a couple of projects we are focusing on as a group but all are welcome to work on what ever they please. I also am hoping to finish a redwork Christmas quilt I started for 2008 that is VERY close to the finish line, and an emboidered basket design of 12–I'm on the fifth basket. It's going to be a busy year but that's the way I like it! My New Year's resolution is to try counted thread embroidery, something I haven't been enthusiastic about in the past. In fact, I just ordered fabric and threads to make the biscornu featured in the last Inspirations. Waow ! What a wonderful give-away !!! I never make any New Year's resolution. I prefer listing personal and professional projects. Regarding embroidery, I plan to work on a sampler mixing needle painting and stumpwork ! My chief resolution for the coming year is to get more organized. In general, I need to figure out better organization for my various craft equipment and supplies. In specific, I need to sort my embroidery equipment and materials in such a way that I can have some pieces to travel with and display at educational demos, while still having things ready and handy at home to work on. Best wishes to you and yours for Christmas and the New Year! This is a very exciting give away and I would love to win it!! This fits into my overall philosphosy of my main New Year's Resolution – and that is to make sure I do something that feeds my soul – yoga and needlework do the trick!! Thanks so much for all you wonderful posts and I hope you have a great Christmas..
My only New Year's resolution will be to stitch small projects and learn something new with each one. Have a Merry Christmas and a Happy New Year!! Of course I would love this DVD. I love how you bring things like this to my attention. I guess if I have a resolution this year it is to spend more time on me and things that interest me, such as my stitching. I often use all my time on other people/things and leave nothing for myself. I would like to try and get one stitching project significantly forward in progress each month this year. It's a big goal, but one I think I can accomplish. If I don't win, I just may purchase the product. It really looks wonderful! 2) Not to commit on any obligation stitching, exchanges and RRs in particular. Mary, yes I have a huge resolution. I am going to finish all my unfinished projects. I have about 12 so one a month is a good goal. I think I can do this and still get new stitching in. Thanks for this great offer. Trish is awesome! On this new year I would like to do something different! I have two things in my head and my New Year's Resolutions is: that I would like to do these two!! Part from that is return to my first love in the embroidery, I really know. Thanks so much for this opportunity about the DVD!!! Hi Mary, what a lovely gift for someone. My New Year's resolution is to keep my promise to myself that I am going to spend the hot January afternoons stitching. The cooler mornings will be spent in the garden. I have been in a sewing funk and had already decided that after all the christmas stuff is packed away I am going to sit down every day for at least an hour and do some form of needlework. Hopefully I will get interested again and be back to my daily stuff. Have a Very Merry Christmas and a Sewing New Year. I have barely tried needlepainting, but am really interested in it. My resolution for 2010 is to do some needlework EVERY week, and to complete a couple of project that are 'almost' complete right now.I actually think I can stick to these! Enter me in the drawing, please! No stitching New Year's Resolutions for me…it would turn it into a grim duty instead of free-time fun! I would, however, like to experiment with stumpwork this year. Thanks for holding this drawing. Hope you get caught up on your holiday to-do list! Happy Holidays, Mary and all. My standing resolution is simply to stitch MORE, and it's the same in 2010. I would like very much to refine my long and short stitching; I would be very grateful for the CD from this wonderful artist…and you! Thank you, Mary, for all you do here. Well, I shoud write, that I will not make any stiching projects until I finish my doctoral thesis, but 😀 I need to finish at least two or three cross stitch projects. I have many many started some years ago. They are not interesting for me now, but some of them were started for my mother, so they should be finished. I hope, that I'll have some time to try needle painting and maybe stumpwork. And I must to stitch your long & short stitch lessons. Big plans… I'll be very happy to make half of them. My one resolution is to finish the silk, satin and brocade crazy quilt I began 45 years ago(that's right 45!). It is an annual resolution, so I am not sure if it will actually get finished this year. I will probably qualify as an antique by the time it's done.I am also looking forward to getting back into the thread painting and crewel work that I used to do, after a long time of just doing counted thread embroidery and hardanger. This CD would be just what I need to get back into it. My New Years resolution is to learn the long and short stitch. After one of your previous give aways I purchased Trish Burr's needle painting book. The projects are all so beautiful. I have purchased the thread for the sunflower project and need to complete it by March for a friend's birthday. I enjoyed your tutorial on long and short stitch, and in the coming year, I hope to explore this further. I don't think I'll make an outright resolution, but I'm going to attempt to work on improving my craft as many times in a week that I can. And, this cd would be a nice birthday present, especially since mine is today. Hello, here a greeting from the Netherlands.What I'm going to do in 2010, is trying to perfect my stitching.When I have my careless days, I will not touch a needle and in my better days I will stitch twice as hard. And with the CD I hope I will by more inspired to make reale nice, beautifful neadly stitching. I want to spin some silk embroidery thread and then use it this coming year…hey, I can dream, right? That looks like dynamite, Mary–thank you! GREAT Giveaway idea. My New Year's resolution is to create a useful and thoughtful blog on one project that I'm working on. That way others can learn from my mistake and I can hold myself accountable to complete a wonderful stitching project. Perhaps the goldwork glove….. we'll see. Here's to everyone achieving their resolutions! I am going to be starting a hand embroidered quilt whewe each block is a wonderful flower. I am still contemplating the fabric I am going to use. Right now I am leaning towards a beautiful green linen with som silk accents. We shall see when the New Year comes. Oh, wow! Please count me in! My stitching New Year's Resolution inasmuch as I have one, is pretty common–I plan to get my WIPs done, hopefully by the end of winter break. They're ridiculously close to finished, but I haven't been doing much crafty other than knitting the past couple months. I would like to resolve to do some handy work on at least 3 evenings every week. I know this sounds lame, but I have gotten away from stitching and my carpal tunnel doesn't help, but I think I can do better! Are you planning to make any New Year's Resolutions that involve stitching? If so, what's one of them? Clean-up and organize my hand embroidery "stuff". Hard to get motivated to pull out a rpoject for 15 minutes of stitching with the disaster I have right now. Also: give-away the patterns and stuff I will never get to so they can find a good home with someone who will use them. Another great challenge give-away! Yes indeed, I intend to try gold work, long and short, Hardanger, and simply finish embroidery projects I have started. I also inherited many kits from my mother. I want to work them for grandchildren. I want them to have something started by their Grandmother and finished by me, the Aunt. Even though I am very new at this embroidery game I am raring to try so many projects in the New Year. My first beginner smocking class starts January 10 which I am eagerly looking forward to. Also I have a "Picnic" quilt well underway to complete for my daughter and her family. Still embroidery to finish on it before piecing it together. Have a lovely Christmas, Mary and a very happy New Year. I am going to try my very best to stitch for at least half an hour every day. I would also like to finish my guild study in surface embroidery this year and take part in the Goldwork Masterclass through Thistle Thread's Open University. And no procrastinating! Hi, yes I have a new years resolution that I will finish at least 2 UFO's and do one of the projects in my stash that I have had for over 2 years. The other resolution is that I will get my projects organized properly so that when I go to stitch I will not spent a lot of time looking for stuff. Best of wishes for the season to you and yours Mary. Boy do I have some resolutions! Other than hoping to finish some of the huge number of projects I have on the go (mostly cross stitch) I have some small stump work project I want to try. I also plan to tackle my long standing fear of getting started with surface embroidery and thread painting. My new years resolution is to finish my daughter's quilt which has a lot of embroidery on it, including a stork that will be thread painted. I am very much a beginner at thread painting but you don't learn unless you try. Trish Burr's CD would sure help me. I have one only of her books, and this DVD would be a great addition to it. for my new years resolution is to try and get into more of a routine with my stitching. I have a couple of projects that I'd really like to finish in the first few months of the year, and this would start it off perfectly. Hi, I love your site and I viewed the DVD and contents. It is beautiful. I have been doing some work lately, but my New Years resolution is….to quit smoking. I am going to use my hands making things and embrodery to keep busy. I think this DVD would be a wonderful help for me to learn how Trish does these wonderful projects. I want to wish everyone a very Blessed Merry Christmas and a safe and Happy New Year!!! For 2010 I am going to exercise more and lose some weight. What does this have to do with stitching? I have noticed that when I sit to stitch, my hips start hurting, and I do not have as much energy to focus on my stitching projects. I find taking a few moments during the day to take care of my body, helps with those 2 things. And I have a number of stitching projects I want to work on this coming year- an on-line clas with Thitsle Threads, Desert Landscape Mandala by Chatlaine, Mermaid Song by Victoria Sampler, and numerous other projects that include embroidery and ..Stumpwork! Thank you to Mary and Trish Burr for this fabulous gift! Trish is one of my favorite textile artists. I use her books and apply her lessons throughtout the year. I love Trish's work. It's very kind of you to do this, Mary. My stitching New Year's resolution is to choose different designs instead of mostly Asian inspired ones this year and to toss my needle after each project. My acid hands are hard on needles and I'm keeping them too long and abrading my threads. My new year's resolution is to finish embroidering my backpack for when I return to college after break! Wishing you and your loved ones a happy & cozy holiday season! Thanks for putting out this blog: I've finally got the time, supplies, (organized) room and inspiration for *several* projects. These range from simple household things (shopping/produce bags) to home decor (lots of windows & linens!) and embellishing/updating thrift store clothing finds. Thanks again for your detail and dedication! I really look forward to your blog and the info you so generously give…and speaking of giveaways this one is great! I love Trish's designs and this CD looks like it would be a great way to learn how to do needle painting. For my stitching resolutions I will try to finish an old project before starting a new one. I am getting behind on my UFO's! This coming year I have vowed to not let my stitching room get as chaotic as it has been this past year. I am determined to be able to see the surface of my work table. Do you think I have any chance of achieving this? Oh my! It would be totally wonderful to receive this special instructions and training on needle painting!! I would like to try doing some of this in some miniature quilts in 2010. My 2010 resolution is to finish some of my large projects and move to smaller miniatures. I have learned so much from reading your blog–so much I want to try and experiment. I believe if I move to smaller projects—I will be able to experiment more, improve my skills, and have more results too! Thank you for all the informative news and updates! Merry Christmas!! 2010 – I resolve to make time to stitch EVERY DAY! I always plan for it, dream about it, and anticipate it, but when it comes to actually stitching, something else gets in the way. Whether it is work at home, computer distraction, or fear of failure I cannot say. But I love to stitch and I love needlework, so why aren't I doing it? In 2010, I will – no evasions, no excuses. When I am too old to stitch it will not be the work or distractions or fear that I regret, it will be the time I could have stitched and didn't. Yes, I am planning to include stitching in my resolutions for next year. Finish the ufos I have right now and start learning the beautiful stitches that Ms. Corbert teaches. I enjoy her instructions and illustrations. So kind of you. and yeah, I ve some resolutions realted to stitching, I am planning to learn some Indian embroidery and to make some quick home dec projects ..thats it..
Merry Christmas and very Happy new year !!! My News years resolution is going to be to take time for Myself. This includes time for working out and time to work on needlework projects that I have been wanting to work on. I plan on writing out my strategy for accomplishing this the day after Christmas. Oh, I have to enter this one as I have wanted one of her kits for a while. I am wanting to work on some crewel work and this would be wonderful. As for stitching goals, I try not to be very strict with them as I know I won't keep them very well. One goal I would like to have for this year is to spend some time stitching every day with a project that I put at least one strand in. I have been working on my older WIP to finish them and will continue that into the new year. Really my biggest goal is to just enjoy the journey. I think for 2010 I promise myself to finish 3 of my many UFO's. I know I'll not finish them all, because I'll get excited about starting something new that's caught my fancy….but just 3!!! That should not be so hard to do!!! My New Year's Resolution for embroidery is to find time often (every other day at least!) to stitch, even if it is only for fifteen minutes. I always think twice before commenting on your giveaways.First I look carefully at what the item is and then ponder if I would really love having it.There's no point in putting in my name for something just because its free, right? I think I didnot participate in the last one ,but this one I would surely like to. My resolution for the next year is 'Learn,learn and learn' – more stitches,techniques and embroidery styles.I also find the need to improve the back of my embroidery.I'll have to strive towards that. Hope you've a wonderful christmas and a fantabulous year ahead. I plan on making a few new years resolutions regarding needlework: 1. to get more organized in my studio so that I can fine my materials more easily. 2. set aside some time each day to stitch on one of my many projects in progress. 3. Lastly to learn a new technique every month. Thanks and Merry Christmas to everyone! I'm resolving to get back to some regular stitching in 2010. I've been so focused on crochet this past year that I haven't accomplished anything in the way of embroidery in 2009, beyond embroidering on some of my crochet projects. My resolution would be to learn more embrodiery stitches and try them on the dresses that I would be stitching for both my niece..also, I plan to work on some bedspread some cartoon characters in embrodiery for my niece to play when they visit us.. This year I finished all my UFO's…well almost! Next year I am going to get completely out of my comfort zone. I have enrolled in a weekend design workshop and am saving to enroll in an online design course. This is someone who has no ability to draw – AT ALL. I am rather nervous, but not averse to a challenge. Do enjoy your Christmas. May it be blessed indeed. I would like to wish you and your family a Merry Christmas and a great year ahead. My New Year's resolutions are two different areas- I would like to begin work on documenting some of the needlework styles of India. I am also planning needlework classes for kids in the age group 10-15. I'd love to win that DVD! I've been struggling with learning thread painting and plan to really tackle it this coming year. Many thanks for all the awesome information and education you provide, Mary! Once again, thank you for a year full of inspiration and encouragement! I don't know if I would have started stitching again without your blog, and my stitching would have been much poorer and less interesting, I use tips and resources I've learned from you daily, and it gives me so much pleasure! I don't have New Years Resolutions I have a "Rolf List", an idea gleaned from Rolf Harris, which is a list of some fairly specific objectives you want to have aaccomplished by next New Year. I publish mine on my Live Journal blog. It includes making a Celtic Goldwork Cross for the Church on with whom I have worked a lot in partnership this year, even though I myself am Pagan, I really value them as people and partners, so an "interfaith" cross is on my list, and to do a really big Arts and Crafts project for my brother's Arts and Crafts home. I'm thinking of a runner for their 12 foot dinner table, done in Ricami work, from Therese Dillmonts Ricami book on the Antique Pattern Library. The idea is to have plenty of goals, to make them asprirational and a bit stretching, and most importantly give myself credit for any progress towards them at all, not to try to do all of them all at once, give myself full credit for any I have achieved, decide whether any I havn't achieved are still relevant and if they are not, let them go without guilt. If they are still relevant I keep them on the list, again without guilt. Usually when I do this I am pleasantly surprised by how much I have achieved, rather than feeling guilty over my "failures". Mary, you are so kind and thoughtful to give away this wonderful CD so one of your embroidery followers can learn or enhance their skills! That is my New Year's resolution is to enhance my skills on the few stitches I already know, but also add new ones to my repetoire. After discovering your blog in November 2009 I have read your e-mails every day and have tried some of those stitches on sample cloth. Thanks for sharing you love of embroidery. Merry Christmas and Happy New Year! hi mary, its just magical to see how trish burr works with needle i recently bought oner of her books and did finish a magnolia on raw silk,though i am a novice in thread painting but tried hard to achieve the effect,as your lessons on long and short stich helped me a lot also my new year resolution is to make cushion covers, table mats and wall hangings to decorate my home its more satisfying than spending those dollors. Hi Mary, its always good to have nice projects from you ,its just wonderfull to see how Trish Burr works wonders with needle recently i finised a magnolia from her book on raw silk it was good and your lessons on long and short stich helped me heavens to understand the shading, well my new years resolution is to refine my skills for needle painting and make heaps of stuff from cushions to bed sheets i just love embroidery inspite of having a two yr old i take out time to enjoy what i love to do. I love Trish Burr! My new year's resolution is to finish the quilt I've started before my baby is born in April.. already not looking like I will – I get distracted by other projects pretty easily! My resolution for 2010 is to learn about Goldwork, and stumpwork.I ask fot books about these from Santa and I'm sure I have been a good enough girl to receive some. I don't make new year's resolutions; but I do have an embroidery project: embroidered tree skirt with "Merry Christmas" in three languages to represent my husband's heritage and mine (my goal is Christmas); and once the new year comes, I will start focusing on making baby stuff (sewing, knitting and embroidery all together) as we have twins on the way! I plan to encourage my creative self on a daily basis. I have a CQ project that I started last year that I plan to finish and hang this year so I need lots of stitches. I'll be using your video library a lot. My New Years resolution is to make beautiful things for my new house with my new husband! 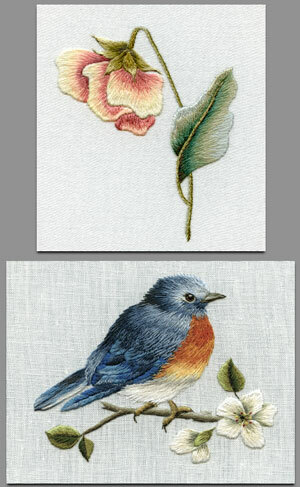 I adore needlepainting and would love to make the bluebird for my ninetynine year-old mother. The bluebird was a symbol of the love in her marriage…I would like it to be not only a gift for her, but a symbol for our new marriage. I would greatly appreciate being considered since last year was so horrific financially that having a beautiful gift like this will mean the new year will be better. My stitching resolutions for the new year are to finish my crazy quilt embroidery and embellishment and to learn the long & short stitch and stitch a project, not sure if it will be a bird or flower. Thank you for another wonderful giveaway. Merry Christmas Mary! I have a great solution! My new year resolutions is stick with my Stash Diet and before buying anything, ask myselft "If I really need it?". This worked very weel for me this yer and I think I will keep it for the next one. Also I want it to be a year of giving. Thank you for the nice giveaway, Mary. I have had so many other projects on my list of to-dos, I haven't had time to stitch. I'm working on the list, but I'm resolving to start regular stitching in January. I really miss it! This is a valuable piece of work! This is the kind of stitching I like to see. You make it your own and bring it to life with deminson. I will be working on a jacket for me and clothes for 3 year olds. I like to stitch something on each item, making them special. Thank you for a chance to win this. My New Year's Stitching resolution is to actually do some. Ok, I do some now, but I want to do more! I make time for everything else and need to reprioritize. My New Years Resolution that involves stitching: As I pack my house to move I keep coming up with UFO'S, unfinished objects. Most have the pattern and thread, others who knows. My plan is to get every thing in order by project or by the year in history they would have been worked on. Then set down and do them until I have empty boxes for new projects. I have seen so much more I would like to do but first come first done. When I lived in Japan as a child I saw a lot of Needle painting silk on silk. It took my breath away and still does. My Mother even took classes and I have two of her works. All my life I have looked at how each thread is laid and the detail of each flower, and wondered at the skill it took to lay each thread. I would one day like to master this art form. I also have your project on needle painting that you did this summer. Another project I will number and get to. I enjoy you sight and check it daily with excitement and joy. 1. to embroider every day without fail even if it's only 10 minutes. The peace and sense of calm that comes over me when I pick up a needle and start to create something is so wonderful. 3. last but certainly not least – to teach anyone who asks to learn how to do embroider and to share the great community of embroiderers out there! A wall hanging combining appliqué and embroidery depicting memories of our travels locally and overseas. My New Year's resolutions definitely include a crewel project (wool on linen)that I designed myself. It features a tree, a dragon, and a lady with a broom. Due to poor closeup vision (currently +8.25)I work at a larger scale, but still use needle painting techniques including long and short stitch. Wishing everyone everywhere a happy holiday season and a fabulous New Year. My stitching resolution – finish those UFOs from years past. That should keep me busy for all of 2010! Happy Holidays, Mary, and thanks for your wonderful site. My New Years Resolution, Not to be to hard on my self. learn to enjoy embroidery with out worrying so much about what others think of it and let it be fun, which is something I fine hard to do. This is an interesting give away.. I would like to participate..
Well I usually don't make any new yr resolutions for I believe each day is a new beginning and u can take resolutions on any fine day but more important u stick on to it.. what do u say? In 2010 I want to continue my learning process and stitch more n more… as much as I can..
1. get perfection in embriodery. 2. Learn the Long n Short Stitch along with other Indianised versions like the Kamal Kadai and navar work. Though there are lot of tutorials, its important to gain hands-on experience. Therefore year 2010 is for accomplishing and fulfilling the simple desires of life. No New Years Resolutions for me. I'm having them about once a month anyway, so no need to add them on a fixed date just because anyone else does. Have a nice christmas everyone! Mm! Definately a great tool and as for new year's resolutions? I'd like to spend more time stitching and enjoying it – less on worrying about why my result doesn't match exactly the pattern! Thanks for the great giveaway and even better – a year full of advice and fun things to stitch! I thought I left a comment but guess it didn't go through. will have thread painted flowers or Sre. I have chosen to do the Magnolia, Pink Sweet Peas, Purple Pansy, Arum Lily, and Rust Bearded Iris. The remaining centers will have SRE . wishing everyone a Merry Christmas and Happy New Year! I'd like to resolve to do more stitching, even if it's just a little everyday. And the DVD is gorgeous. I will definitely contact Nordic Needle, and suggest they carry the kits. My new years reselution is to finish the crazy quilt I just began. It is my first and I have been practicing my embridery before I put any embroidery on my crazy quilt. I have decided to make one I can actually put on my bed. Which I know is a big undertaking. I always wantwed to make a crazy quilt and since I am almost 60 it is time to do the things I always wanted to do. Trish's cd would be a wonderful and great help. My stitching resolutions include finishing the small projects from guild meetings that are stitched but never get "finished". There are too many in my closet. The DVD/CD looks great. Someone will be very happy. It is a wonderful give away. I have been wanting to do some ribbon embroidery for a long time. It's one of the embroidery styles on my to do list to make my costumes look authentic. Get better at my blackwork. I can only use aida cloth at the moment. I am not very geometrically orientated. I usually do not make resolutions, however I do set goals especially for stitching. This year I want to design a stitchery of the birds in my yard at the feeders using wool and or silk threads. The sight of the pansy and bluebird pictures certainly has the right side of my brain raging at the left side to do something about my very unorganised work room. So, I'm definitely going to organise that room. Not fussily or I'll give up before I'm through. Just practially enough so I'm able to enjoy my precious embroidery time without frustration. My biggest resolution for this coming year is to get tenure! 🙂 That doesn't involve embroidery, but as I wait for the dean and provost to rule on my tenure case, I should have some time to do some stitching. I want to make the Indian girl project and finish up a half dozen other, smaller, easier ones waiting in the wings. My resolution for this year is to finish the stole that is designed, but only just begun. I used one of Trish Burr's books as inspiration for some of the elements and so would love to have the CD. That is a great CD. My New Year's resolution is to start and finish one new project a month and to learn one new embroidery technique. I am just starting embroidery as of a few months ago and have loved it. My main goal is to finish a cardinal that I started in Nov. that was sort of supposed to be finished around Christmas. I am a week or two away from completion. Then I want to pick a project to expand my stitching ability. I want to try some crewel at some point this year as well as a stumpwork project. I have loved your blog for teaching- thank you so much for the time that you give to it! So pretty! I am really enjoying your blog and hope to soon have some pretties of my own. I don't make many resolutions because they don't seem to stick! However, I really do need to make a dent in my Unfinished Needlework Pile, so in 2010 I resolve to work on one unfinished piece each month and hope to get some finished, and resist the temptation to begin too many new projects! In the New year I resolve to stitch more and eat less! I've just discovered your needlesite and find it very engrossing. I would like to try this type of needlework(the painting) that is. I do all kinds of crafts constantly but have decided to work on embroidery for next year. After all I'm still just an old fashioned girl. Merry Christmas to everybody. Now I have to get ready to go to work on Christmas Day. I'm a nurse. Happy Holidays! Love your giveaway! My New Years resolution is to get my stash out of storage and get my minky quilt done. I want to finish at least four projects (emphasis on finish), one for each quarter of my school year. new year's resolution would be to straighten my crafts. grandchildren love see threads and balls of thread. Thanks for the offer, Mary. My major new year resolution is to join an embroidery class, in addition to the online classes i am attending. In fact, i have already acted upon my resolution and made enquiries at the Continuing Education sub centre in the Womens' College here. The classes are slated to begin on the 1st of January 2010. Its going to be slow, as i will be getting only one hour of my lunch time to attend the classes. But i have resolved to keep it steady. My another resolution is to steadily build up – stitch by stitch – my cross stitch project on 'Oscar and his friends' showcased by jayne Netley Mayhew and Nicki Wheeler in their book "four seasons in cross stitch'. Being a working woman and mother of two highly demanding boys aged 4 and 2 doesnot leave much time for my embroidery pursuits. still i have resolved to perservere. Hi Mary, my only stitching resolution is to finish the long and short stitch project I started following your tutorials. After that we'll see! I would like to ask… in the DVD does she show you step by step how to work the Long and Short Normal and in curves? Previous Previous post: Long & Short Stitch Lessons – in French!